“So have you had success with your guard dogs?” I asked Leo Barthelmess. Robin and I stood in the fading light of a too-long, too-hot day, happy to see the evening come, next to the old one-room schoolhouse where we would be spending the night. Our horses grazed amid the playground equipment, eagerly seeking out the overgrown clumps of alfalfa scattered throughout the former lawn. Too curious to hold back my questions until the morning, I was pestering him about the dynamics of his 18 to 20 Livestock Guardian Dogs that watch over the sheep on his place. They work in teams of up to 8 dogs, each team protecting hundreds of sheep out on open range. “Well, without the dogs we couldn’t run sheep, and with them we can, so I’d say they’ve worked pretty well for us,” he told me. We looked out over the vast grasslands where Leo, his wife, and brother have run sheep and cattle for decades. Essentially, he explained, keeping the dogs has successfully reduced predation, at least to the point where it is possible to run sheep again. There is still some loss every year, particularly around lambing, and some years depredation is still significant, but now it is manageable. Before they brought in guard dogs, losses from predation made running sheep economically impossible. The old Tallow Creek School house, where Leo Barthelmess let us spend a few nights on his family’s sheep and cattle ranch. Our horses grazed in the playground. Sheep once grazed most of the country we rode through. Now nearly every ranch only runs cattle. Everyone we talked to suggested the same reason for this shift – just too many predators to run sheep now, they said. While eagles and mountain lions take their share, the biggest problem is usually attributed to coyotes. The coyote numbers in much of the Northern Great Plains have climbed steadily over everyone’s living memory. We heard their calls often, though we only saw two coyotes over the three months we were on the road. There are a few reasons why cattle ranchers might want to run sheep. By running both cattle and sheep, ranchers can diversify their business and reduce their exposure to fluctuations in the beef, lamb, and wool markets. They can also more efficiently utilize the forage on their land because sheep tend to prefer leafy shrubs and forbs and cattle tend to prefer grasses. 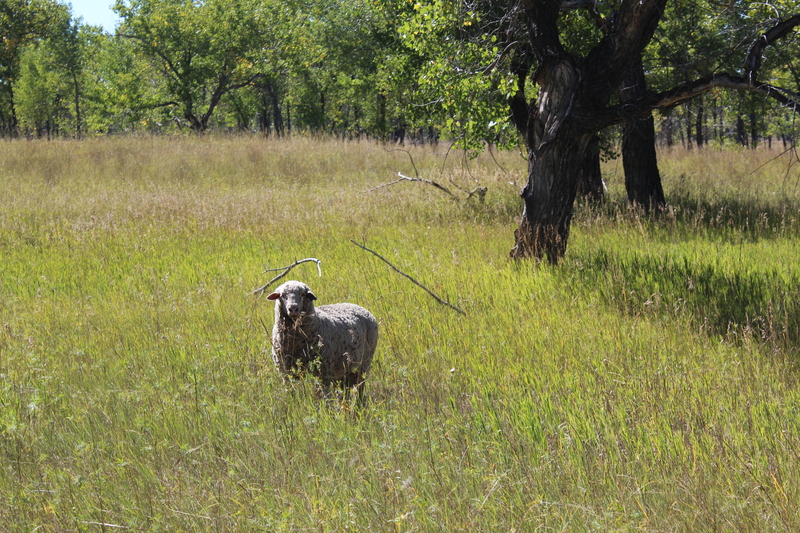 Sheep can also be a huge help when dealing with certain invasive noxious weeds. 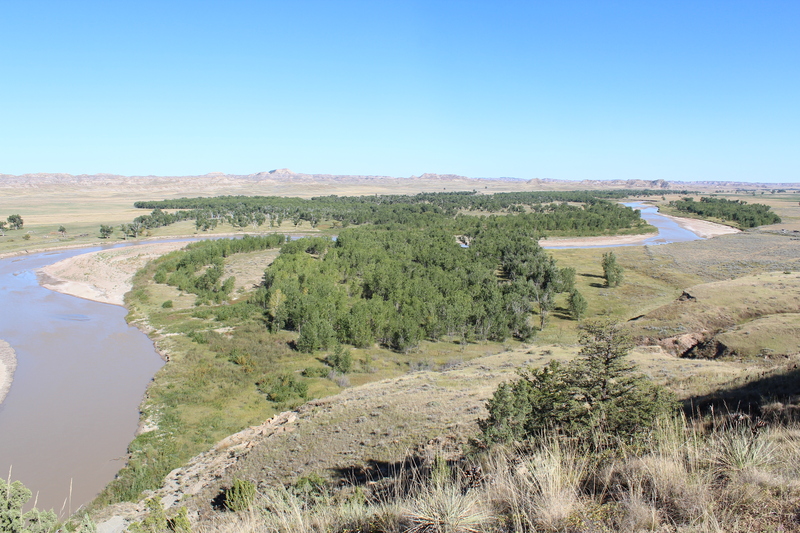 For a month Robin and I rode our horses along the Powder River, where the bottomlands are heavily infested with leafy spurge, a plant poisonous to cattle and horses but tolerated by sheep. Some ranchers are finding sheep to be helpful in utilizing the otherwise ruined pastures, and that by grazing the aggressive weed, the sheep help give native plants a chance to compete. Running sheep can help ranchers stay in business, which is good for grasslands threatened by development and plow-up. Ranchers cannot run sheep profitably, however, if predation losses are too high. Leafy Spurge, a noxious weed poisonus to cattle and horses, is a serious problem along much of the Powder River. Sheep can be used to mitigate the impacts of the weed, if they can be protected from predators. 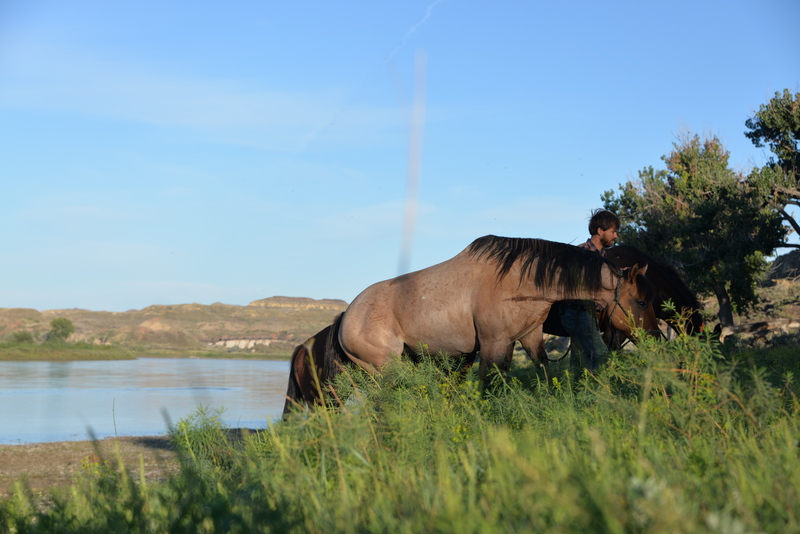 Leading the horses through a thick patch of Leafy Spurge on the banks of the Yellowstone River. 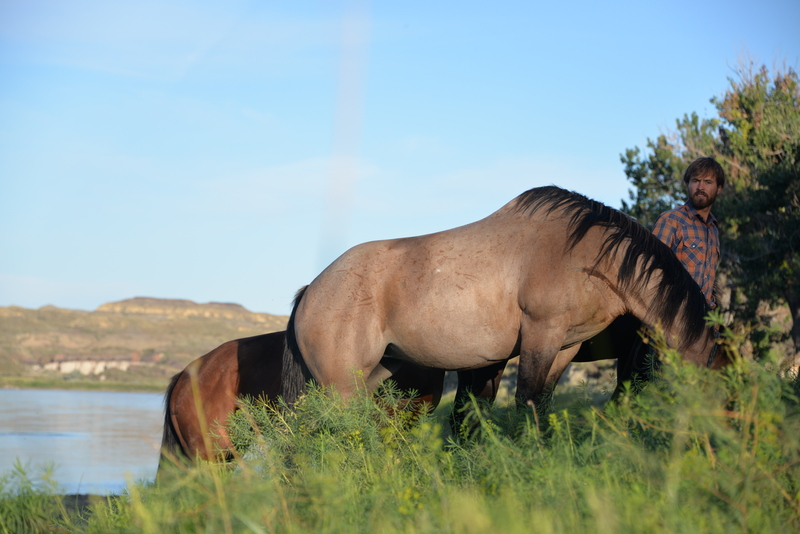 It was sometimes challenging to find areas for grazing the horses that were close to the water and weed free. Usually we settled for an area with a little spurge, and hoped that the horses would avoid eating so much of it to make them sick. 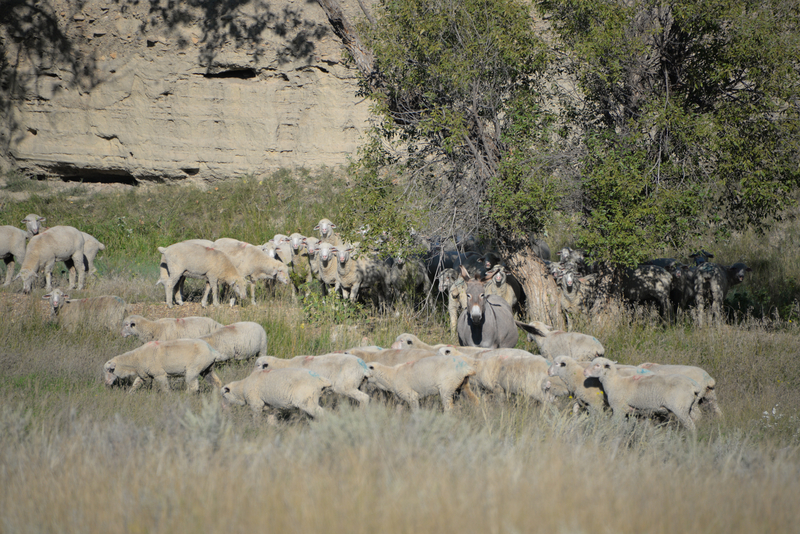 Unlike horses and cattle, sheep can eat leafy spurge, making use of otherwise underutilized pastures and helping to suppress the weed’s dominance. There was a time when predator numbers throughout the Northern Great Plains were extremely low. Between the huge numbers of homesteaders that once filled the prairie like exurban-ranchettes, a thriving fur trade, government sponsored bounties and predator control officers lacing animal carcasses with poisons, even coyote numbers were decimated. The sheep industry flourished at one time with Irish and Basque shepherds building huge flocks on the open range. Where grizzlies and wolves had been killed off, shepherds and homesteaders waged war on the coyotes and “chicken hawks” that took their lambs. The ranchers’ only defenses against the predators were poison, traps, and guns that they used liberally to defend their sheep. Since the rural population has readjusted to the realities of the climate, certain poisons were banned, and the Endangered Species Act was created, many predators have rebounded dramatically. A prairie falcon with its kill. 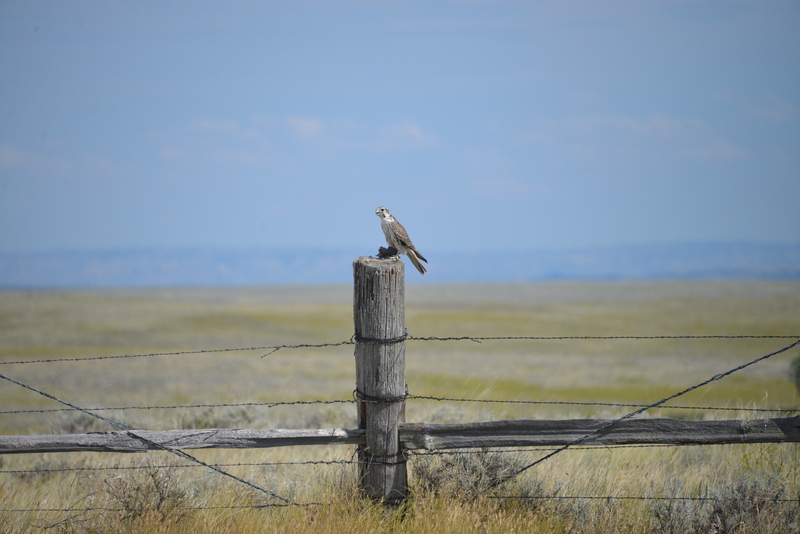 Some raptor populations have rebounded across the Northern Great Plains, though all of them are threatened by loss and fragmentation of habitat. The poisons once used to eliminate coyotes also killed off huge numbers of non-target species, including some raptors. Widespread shooting of eagles, hawks, and falcons, was also common amongst homesteaders. The return of some predators to the prairie is cause for celebration. All eagles, hawks and falcons are now protected under federal law, and many cherish their flight above the prairie. The grasslands soundscape would be deeply impoverished without the wild yipping and bizarre cackling of coyotes. Ecologically, by keeping the rodent and rabbit populations in check, a moderate predator population helps stabilize population explosions of those tiny but voracious grazers. On the other hand, an overpopulation of predators, just like an overpopulation of herbivores or an overpopulation of noxious weeds, can be unhealthy for the ecosystem. If there were a way to make ranching profitable and ecosystems balanced without once again totally annihilating these predators, it would be a huge win for grasslands, keeping the land undeveloped, unplowed, and ecologically healthy. There was one tool that the immigrant shepherds left behind in the old world: Their guard dogs. 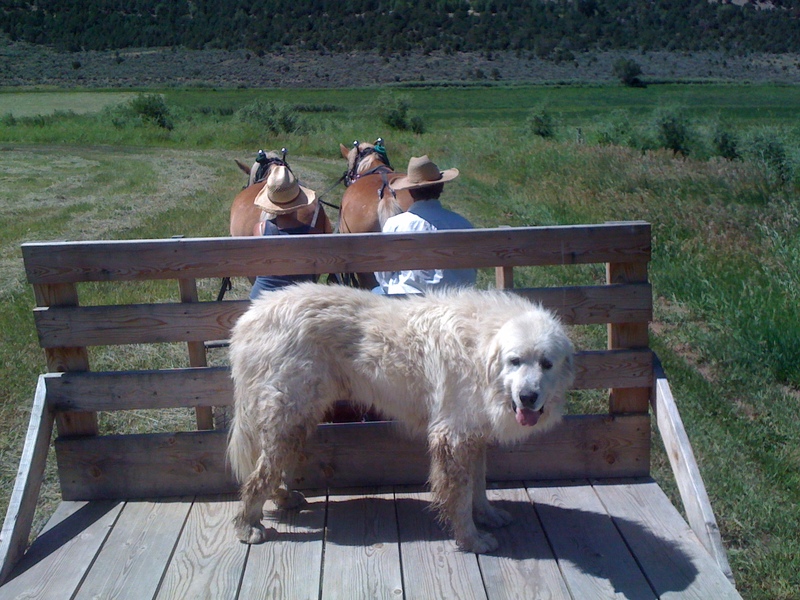 From the late 1800s to the late 1900’s, Livestock Guardian Dogs were not a part of the American rancher’s predator control repertoire. Slowly, over the last several decades, more and more people have been importing the dogs, breeding them locally, and experimenting with the their use. They are gaining popularity, and that’s good for both the sheep and the predators, and by extension the ranchers and the environment. Riding past flocks of sheep huddled under the shade of a few trees or an old piece of farm equipment, there was often a guard dog tucked in amongst them, panting with the lambs in the heat of the day. It was hard to tell them apart from a distance, fighting for the shade, but if we rode close enough the dog would walk out in front, sizing us up and staring us down, barking a great deep bark if we drew any closer. 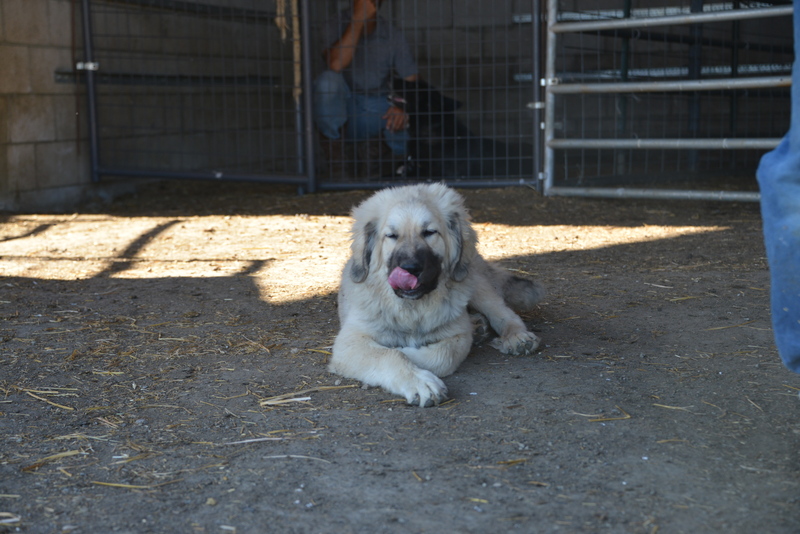 Liam, an adolesent Livestock Guardian Dog, resting in the shade with a few of the lambs he protected. He barked and postured bravely for such a young dog when we first rode by, but after his owner introduced us to him, he melted into a squirmy puppy. 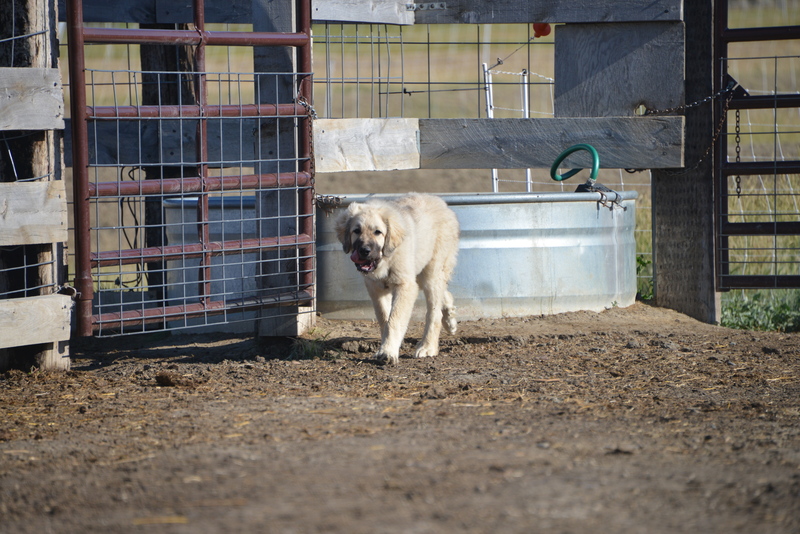 Livestock Guardian Dogs have been bred over generations to instinctively protect the livestock they bond with from wild predators, stray dogs, and thieves. Unlike herding dogs, they are not trained to help move the livestock. They are imprinted on the livestock from a young age, and live with the livestock at all times, working independently from human commands and directions. They are trained to be respectful and submissive to their handlers, but not to perform tasks the way a herding dog is. There are many breeds of livestock guardian dogs, from the huge white Great Pyrenees, Akbash, and Komondor, to the Anatolian Shepherd Dogs, the Spanish Mastiff, Kangal Dog, Maremma Sheepdog and Sarplaninac. The breeds have different traits, but largely work in the same manner. They live independently from humans with the livestock, eat at feeding stations near the flock, and patrol the area for predators. Some breeds and individuals tend to stay close to the livestock, barking as a warning to any predators and only engaging a predator if it actively attacks one of its flock. Others have been bred to more actively chase away or kill predators that come too close to their flock. While their ancestors were bred to protect flocks from marauding thieves and unscrupulous neighbors, they generally pose no threat to passersby, and so I wasn’t too worried for our safety when we passed guard dogs. If we left their sheep alone, I was confident the guard dogs would leave us alone, only barking to warn us of their presence. On the other hand, I was a little nervous about our dog Winnie. People we met on the trail warned us to keep our dog close by because their guard dogs might kill her if she was alone. “It’s happened before” they told us regretfully. 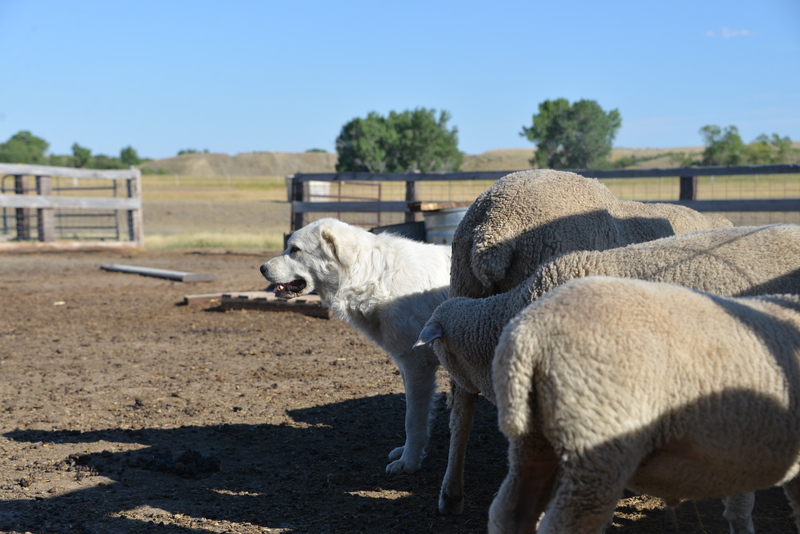 Livestock Guardian Dogs instinctively protect their flocks from stray dogs. That is usually a good thing. Behind wild predators, stray dogs are the second leading cause of livestock loss in the United States. As it was, we kept a close watch on Winnie, our black German Shepard cross that looks a little more wolfish than might be good for her, and learned to heighten our vigilance whenever we saw a flock of sheep down the road. Luckily, the only guard dogs we came across unaccompanied by their owners were young and too submissive and playful to pose a real threat to Winnie. It turned out that the biggest injury we sustained from a guard dog was the theft of a freshly baked slice of banana bread stolen from our camp by a friendly dog named Liam. Seeing as we were sleeping in his tractor shed and charging our camera batteries in his sheep’s manger, we really couldn’t blame him. Robin working on some writing in the tractor barn where Liam later helped himself to some Banana bread. As consumers, one of the steps we can take to help with the stewardship of our country’s prairies is to buy products that help support the healthy management of grasslands. We can buy grass-raised meat from animals finished on pasture and range, cutting out dependence on feedlots and monocultures of corn that replace diverse native prairie. Buying Organic and All Natural certified products can also reduce certain negative impacts of conventional agricultural systems on native prairie ecosystems. Another option is just beginning to make its way onto grocery store shelves in the form of products labeled “Predator Friendly” or “Certified Wildlife Friendly.” These new certifications encourage and acknowledge ranchers for their use of non-lethal predator control methods, which often include the use of livestock guardian dogs. Dogs are usually used in conjunction with other practices, such as corralling livestock at night, use of electric fences, moving livestock away from high-conflict areas at certain times of year (such as a pasture near a wolf den), or having herders with the livestock. 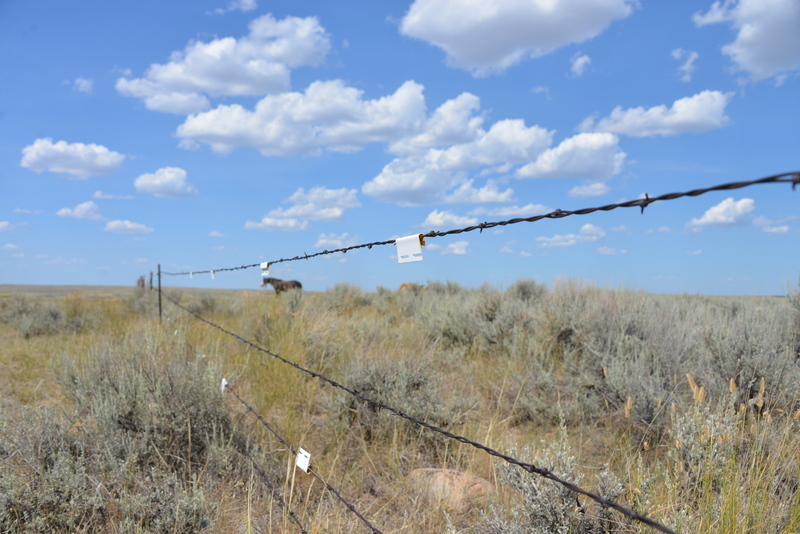 Of course, many ranchers will choose to use wildlife friendly practice such as guard dogs and not seek certification, but seeking out certification may be of interest to others. Take a look at Louise Liebenberg’s blog, which helps illuminate some of the challenges and rewards of working with Livestock Guradian dogs and operating as a certified Predator Friendly ranch. While certification does not currently command high premiums, if demand for “wildlife friendly” products grows with consumer awareness of the label, the opportunity for producers to capitalize on the certification could be significant. More producers might also be willing to join the label if there was more flexibility allowing for responsible predator population reduction when deemed appropriate, as part of an integrated predator management program. 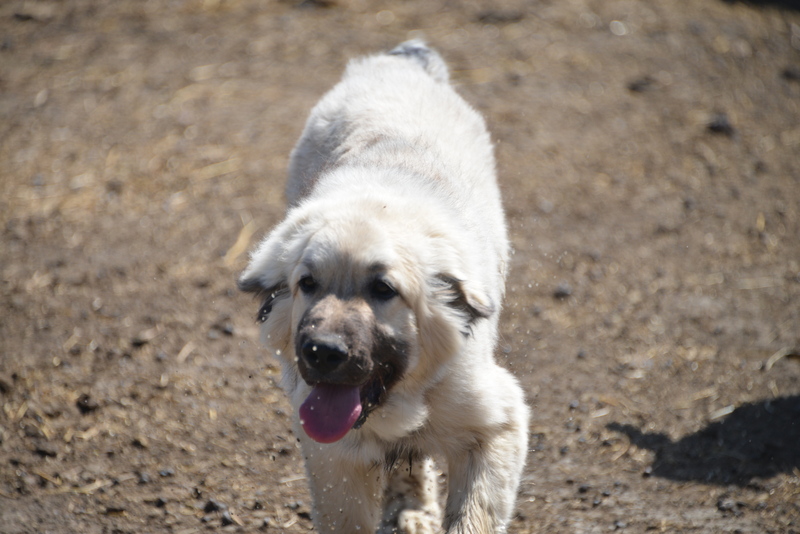 As producers, even if certification does not make sense for your operation, integrating livestock guardian dogs into your management strategy might. Another young pup we met, just learning the ropes. This puppy got along with our dog Winnie, but when the older dogs came by to check on things, we decided it would be best to keep Winnie safely behind a fence in the barn, just in case. Another option for predator friendly livestock protection, Guard Donkeys instinctively chase and attack predators and stray dogs as well. Although we didn’t see any on our ride, Llamas can be used in the same way.